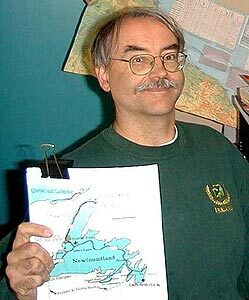 Neil Kazaross, Mark Connelly and I called our fledgling DXpedition to Cappahayden, Newfoundland, in 1991 the first Newfoundland DXpedition. But, in spite of extensive coverage in the hobby press, we were 90 years late. It was a century ago that the real "first" Newfoundland DXpedition took place. 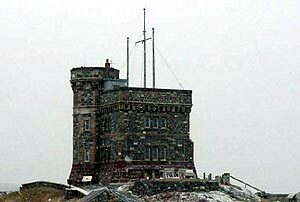 Marconi used kites to hold up wire antennas over Signal Hill, overlooking St. John's, to try to hear a simple "S" in Morse code, sent from Cornwall. Did Marconi's team really hear a signal from across the Atlantic on December 12th, 1901? The frequencies they were operating at would have been just below the modern medium-wave band, and Marconi's experiments were conducted during the day. Today, sensitive, modern equipment on Signal Hill doesn't have much chance of picking up even the most powerful MW broadcasters from Europe during daylight. Furthermore, atmospheric noise is not man-made, and what we now recognize as natural phenomena - thunder storms and junk from the sun - might just once have sounded like three faint clicks. Nevertheless, Marconi was as much a showman and entrepreneur as he was an inventor. Marconi had no time for quibbling about scientific rigor. His report of transatlantic radio reception made newspaper headlines in North America and Europe, and it provided considerable impetus for the commercial development of radio by Marconi and the other pioneers of radio. - Brazilian Beverage: 1 km terminated wire aimed at eastern Brazil. This antenna is also very good for the eastern "Deep" South American countries, and in previous DXpeditions this has been good for southern Africa. - European Beverage: 500 m wire towards northern Europe. This was initially unterminated, but termination was added after the first couple of days. - African Beverage: 400 m unterminated wire towards southern Africa. Whereas this had been a productive antenna in 1999, this year, as in 2000, this one offered no real advantage over the Brazilian or European wires. - K9AY Loops: I used my K9AY loop system in lieu of the European and Brazilian Beverages when we were at maximum shack occupancy. These were usually inferior to the Beverages in signal strength, even though the loops were amplified (Kiwa broadband amps). Nevertheless, it very significant that these loops were competitive with the European Beverage, and, for some European signals, I feel the loops out-performed the Beverage. Mark, John and I set up one more 1-km antenna at a remote site, a five-minute drive south of Cappahayden. This antenna was aimed more specifically at the southern part of Africa. First Bruce and John, and then the next night, Mark and Jim, tried this antenna using my deep-cycle battery for power. Results were very disappointing, but it seems like that this was due to a break in the wire less than 200 meters from the origin. It appeared that a moose or a caribou had walked through the antenna since it was a mess to recover on the morning of the final day. In terms of DX highlights, my own favorites are first-logs of Brazilian stations R. Colméia on 1170 kHz, R. Feliz on 1450 kHz, and R. Duque de Caxias on 1590 kHz, as well as Country R. from the Czech Republic on 1062 kHz, and the Irish station R. Star Country on 981 kHz (first spotted by Bruce). I thank my son, Christopher, who helped me on the first day with the major job of setting up both the antennas (in a heavy downpour) and the shack. We were joined that evening by my wife, Stephanie, and my daughter, Emily. We had a family dinner and everybody had a turn to listen to the radios before Bruce arrived. The next morning we had a family-puts-up-a-K9AY event. I must thank Bruce for the efforts he put into maintaining and improving the antennas, and I am very grateful to all the DXpeditioners who traveled to Newfoundland to take part. Their comments suggest that they had as much fun as I did! 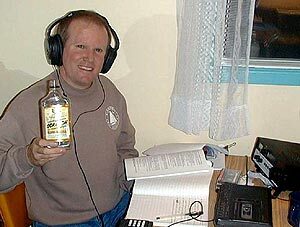 While I was conducting an interview for the National Radio Club's DX Audio Service, Jim Renfrew reversed roles by asking me, "Why do you come to Newfoundland for a DXpedition?" My immediate response spoke of the camaraderie, and the opportunity to learn about potential targets for DXing at home. It's just plain fun to be with fellow DXers in what otherwise is often a solitary hobby, and I left this DXpedition wondering if some of the stations from deep South America that we heard could be possible at home. Toying with Beverage wires is another aspect of a Newfoundland DXpedition that I don't get to experience anywhere else. Of course, I also enjoyed the clear signals, sometimes finding myself distracted from the job at hand, instead preferring to pass the time listening to interesting or entertaining music from the likes of Virgin Radio, France Bleu, Netherlands' Radio 10 FM, RTM Morocco, RAI Italy, Brazil's Radio Nacional, and local Radio Newfoundland CJYQ while awaiting the top of the hour to catch the next DX station identification. After further reflection, I realized that the reason for participating in a DXpedition at a remote location like Cappahayden, Newfoundland can't be that much different than for a Mount Everest expedition. Why do I do it? Because it's there. I'm drawn to the challenge of an exotic DXpedition in the same way that a mountain climber seeks to conquer the highest peaks. Having said that, I believe that both individually and as a group, another Newfoundland DXpedition has been conquered. This DXpedition was highlighted personally by the reception of many signals I don't recall ever hearing before; a nice opening to Iran, Big Ben chimes from Libya, and all the low-power UK local stations. 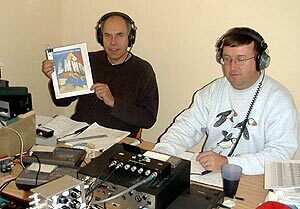 Jim Renfrew gave me the "WAB Award" after I Worked All of Belgium's medium-wave outlets in one night, including the three Radio Trafic Plus stations. Jim should get the award for being the most determined DXer, often at the dials from dusk to dawn, catching Bolivia and Iceland in the early morning hours while the rest of us were sleeping. Mark Connelly put in the extra effort to make sure John Fisher and I were prepared for some remote DXing at the quarry site with a Beverage aimed directly at southern Africa. Unfortunately, the conditions didn't cooperate; a lack of African signals the only low-light. Our intrepid host Jean Burnell should also be recognized for erecting two Beverage wires solo in the driving rain prior to our arrival. By the way, uncharacteristically calm and mild weather for November meant no weather related stories to tell from my seven-day stay, unlike previous Newfoundland DXpeditions. After an overnight rain, crossing the swollen "Kazaross River" to service the Europe Beverage posed only a minor challenge while a harbor seal seemed to watch in amusement. Before departing, John Fisher and I toured Signal Hill in honor of the 100th anniversary of Marconi's famous milestone, after making one last stop at what became the official DXpedition restaurant, "The Riverside" in Cape Broyle. The pan-fried cod there was excellent, but I just had to try the moose before leaving "The Rock" as Newfoundland is appropriately nicknamed on CHOZ "The Rock of the Rock, OZ FM." At least now I can say that I've tasted it (Why? Because it's there. ), and I'll leave it at that as I reminisce this and past DXpeditions while looking forward to the sounds and tastes of those to come. Just getting to Cappahayden proved to be the biggest challenge of this DXpedition. I had hoped to arrive just after midnight on Monday, November 12. Two flights were canceled and rescheduled during the preceding week. Finally on Friday my airline, Canada 3000, went bankrupt. I was fortunate to get a new flight on Air Canada, but now I would not reach Cappahayden until Tuesday night (and still no word on whether I would ever get any kind of refund on the cancelled flight). By the way, I had been dreading airline security in Toronto because of all the equipment I was carrying, but the checker seemed fascinated when I demonstrated the Drake's operation, and I actually had to pull away when he became very conversational after I had mentioned Marconi as the inspiration for our project. He didn't even give the Quantum Phaser and other strange-looking electronic items a second look. As always it was nice to get reacquainted with the other participants, all of whom I'd met on previous visits. Although others were of the mind that conditions were not all that great this year, I had at least a few noteworthy receptions, among them Radio Caranavi, Bolivia on 1550 (a new country for me) and AFN Keflavik on 1530. The others missed out on these because they had decided to put sleep ahead of DX! Although Africa was a special target at our remote "Gravel Pit" site, we had very poor results - certainly not helped by the 1000 meter wire which was unknowingly "moosed" before the second night, leaving only 200 meters, as Jean discovered later when he tried to bring the wire in. In spite of that, I relogged the Angolan on 1484.55, including one burst of signal that was of local quality. As someone has said, or should have said, "a bad day of DX'ing is better than a good day at work"! Unlike the other participants, I decided to give serious attention to longwave beacons, having unwittingly logged a few of them the previous year, and was richly rewarded with stations from Greenland, Iceland, France, Iberia, the Caribbean, Guyana, Argentina, and Brazil. A list of longwave beacons heard by Ken Alexander and Jacques D'Avignon, DX'ing from New Brunswick in September, was an invaluable help in these efforts. On Sunday morning I went outside in the freezing wind to watch the Leonid meteor shower. I had patience for about ten minutes in the cold, but the sky was clear and the show was fantastic. If I'd had the energy, I should have gone out to Jean's car to check for meteor skip on FM, as there are only a half dozen stations audible most of the time in any part of Newfoundland. I had the privilege of bringing in the European wire on Sunday morning, only to have the wire break in at least three places, almost exactly in the least accessible cliff-side spots. The problem was caused when I walked the wire to free it from all the branches Jean had set it on, except for the one inaccessible tree where (I discovered later) he had actually knotted it to the tree trunk, and when I pulled the wire it came apart. The local man on the beach must have had every suspicion he ever had about Americans confirmed as he watched me scrambling up and down the cliffs looking for wire! In the absence of Pablo (my dog back home), the local representative of the retriever breed, Ubu, proved to be a faithful campaigner in following me every step of the way along the cliffs! My wire-work was not a complete disaster, however, as earlier in the week when I checked the length of the Brazil wire I actually found John's missing camera, not even knowing that he had lost it! I remained in Newfoundland for two days after the last wires were brought in. With Jean and his children, I attended a CBC Open House, marking the 100th Anniversary of Marconi's effort. In one room they had a guy demonstrating Morse Code, and it was treated by the crowd like a horse and carriage phenomenon. I smiled to myself, because I had spent the past week deciphering Morse signals on longwave! We also took a ride up Signal Hill where Marconi heard the first trans-Atlantic signal. Please note: he didn't transmit the signal, he DXed it! Since Jean's wife was out of town I was able to make use of her car on a beautiful clear day and drive all the way to Placentia, and then the Ecological Preserve at the southwestern end of the Avalon Peninsula. I tried for some FM signals from Nova Scotia at that place, but no luck. I finished my drive with a visit to the park on Cape Spear, the easternmost point in North America. I arrived there near sunset. Although Stephanie's radio was not of DXpedition quality, its extra-wide channel width was actually a good thing because it allowed me to hear all of the European powerhouse signals on the "even" channels (like Spain on 850 or 860!). A final successful task before heading to the airport was to stop in at the office of NTV and OZ-FM to look into two unanswered QSL letters from the summer. The hardest part of any DXpedition is returning home, because the reception situation is so poor by comparison. In order to complete my written report I have to listen to nine cassette tapes of the stations I heard, hardly any of them has ever been heard here at home. However, I do have the inspiration of a DXP-4 Phaser which I obtained from Mark, and I have been putting it to good use. I am planning to run a wire to the east across the road to give me a bit more edge in getting some TA's. And how about this ... Pablo joined me in the corn field as I was stretching out wire today, and he quickly learned to patrol the perimeter and to flush out any potential wire-eating varmints. And why not, he's from Labrador! Thanks to Jean and his family for helping this whole thing happen, for the hospitality of their home, and the use of a car!
) sent from Poldhu, Cornwall, England to his receiving site in St. John's, Newfoundland. The first medium-wave Newfoundland DXpedition, in November, 1991, celebrated the 90th Marconi anniversary. Neil Kazaross, Jean Burnell, and I were the "co-conspirators" for that initial outing. I've been on a number of these DXpeditions over the ten ensuing years but, in some ways, that first one had the most "magic" to it. Early 2001 was rough for me and my family as my mother passed away after a lengthy deterioration of health. My frequent visiting trips to Cape Cod, which usually included DX, came to an end when my brother and I sold my mother's house. Spring arrived and I managed to get some DX done on after-work outings to the shore. Plans were starting to come together for NF DXpedition #10 to be held in November. With the Marconi 100 connection, it was looking to be a very well attended one, perhaps the biggest ever. In August I booked my roundtrip flight and my anticipation grew following some good Summer 2001 DX outings (including a great Boston Area DXers "DX Clams" get-together in Rockport, MA). I'd been experimenting with antennas and receiving accessory "toys". Neil Kazaross and John Bryant had published some outstanding designs I'd played with at East Harwich in late August. I was eager to try these in the supercharged DX environment of Cappahayden, Newfoundland. DXpedition plans were moving forward at a smooth pace. September 11 started as a regular day at work like any other. But then the news of the terrorist attacks came. Everyone was shocked. The following week was heart-wrenching. Air travel was suspended for many days. Jean Burnell and I corresponded via e-mail: he told me of many travelers bound for the USA from Europe who were detoured to Newfoundland. Thousands of people were in St. John's wandering through town and even sleeping in school gyms. The whole idea of a DXpedition requiring most of its participants to fly in order to reach it was looking shaky. Several would-be participants bailed out immediately. The rest of us seemed to be on-again off-again, based on the latest round of either good or bad news. By October, things were starting to settle down, although Air Canada continued talking about schedule reductions. A week before my departure for the DXpedition, there was a plane crash in New York; soon it became apparent that its cause was accidental. My departure day came and, although I still had a less than fully comfortable feeling about flying and I knew that airport security was going to be different, I'd pretty much dismissed my September fears of something devastating happening at home during a few days away. I sent a box of DX gadgets to Jean ahead of time: no need to get held up at the airport trying to explain homebrew phasing units. Once things got going, this year's DXpedition experience actually went better than some of my previous ones. No baggage was lost, the rental car arrangement was smooth, and the weather was improved despite a mid-November DXpedition this time versus late-October last year. On the flight, I went over medium-wave and tropical-band lists with the idea of capitalizing on any deep African openings that might occur. I arrived at Cappahayden during the evening of Thursday 15 November. Jean Burnell, Jim Renfrew, Bruce Conti, and John Fisher were busy at the dials. They'd been doing well over the previous few days. As well as conditions would allow anyway. After an October characterized by some major auroral activity, November was settling down into more of a mid-range of conditions: tolerably decent DX but no splendid high-latitude conditions to bring Scandinavians to the American Midwest, nor super-auroras to knock out everything but deep Africans and South Americans. I set up my Drake R8A and phasing unit in the shack room that was the "domain of the Drakes" once again. An important part of this and every other DXpedition is renewing friendships and making new ones. This time I met John Fisher for the first time. In light of all that's been going on, good conversation often seemed more important than the DX itself. After all, I've done a lot of solo DXing from the car. I do see Bruce Conti from time to time at the local BADX meetings and outings. The other guys are usually known to me via e-mail. In-person meetings, especially in the company of receivers stoked with good DX, give the hobby another dimension of appeal. Lunches at the fish restaurant in Cape Broyle and group antenna work sessions helped to foster a team spirit. considerably more exciting than Brazilian preacher stations, for instance. In the entertainment category, of course, local Newfoundland radio, particularly CJYQ-930 with its Celtic-tradition "Newfoundland music," provided special enjoyment. On Friday morning (or early afternoon), Jean, John, and I rolled out a 1 km African Beverage (120 deg. bearing) in a somewhat-wet meadow and scrub-spruce woodland near the rock quarry 5 km south of the DX Inn. On Saturday afternoon, well before sunset, Jim Renfrew and I DXed from the car at this Beverage. The Angolans, Gambia, and other Africans were reasonably good (though these were stations I'd also heard at Duxbury, S. Orleans, and S. Yarmouth, MA on good "Afro-nights"). Conditions weren't "popping" for South Africa. Lesotho-1197 and Botswana-909 had been heard earlier in the DXpedition, but by the time I got there, things had deteriorated. Still, it was fun to DX in the car with esteemed IDXD editor Jim Renfrew. He'll have to do this with the BADX group at Rockport sometime. Jean Burnell went out to retrieve the Beverage Saturday evening. He noticed a break part way along its length, probably caused by a wandering moose. If the break had occurred before Jim and I DXed, Africa-pulling performance would have been compromised. 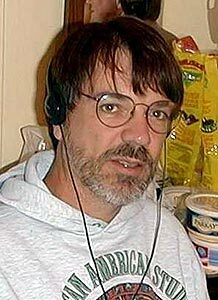 Absent from this year's DXpedition was Neil Kazaross. A bout of the flu, more than terrorism fears, undid his plans. The Kaz antenna gadgets sent to Cappahayden went untested. Neil expects to be at the 2002 DXpedition if it is held. Saturday evening was my unwinding session after returning to the DX Inn from the rock quarry Afro-Bev site. I enjoyed a couple of Heinekens and some good DX chat along with the last few token loggings. At 4 a.m. local on Sunday (18 November), I awoke to get ready for the pre-dawn ride back to the St. John's airport. I spent a few minutes in the dark outside the DX Inn looking up at the fantastic meteor shower display in the starry sky as I listened to the heavy surf pounding the rocks nearby. Even while I was driving northward on Route 10, I could see shooting stars ahead of me above the dark spruce and fir forests. Jim Renfrew had suggested checking the FM band for meteor skip. Sure enough, many normally-dead channels sprung to life for 5 seconds or so per burst with audio coming from who-knows-where. The flight home was uneventful: exactly what I'd hoped for. The ten years of Newfoundland DXpeditioning have been legendary: the best North American Atlantic Coast efforts in the history of the medium-wave DX hobby. Whether there will be future DXpeditions remains to be seen. All the DXers who've participated over the years have to look back and say that it's been a wonderful "ride."